5 We are the language police? 7 Nundu Bay (Mission) etc. We are the language police? Yeah, and why not? Having typo-redirects available only promotes misspellings within the wiki. A blue link is assumed to be a "correct" link, so if someone mistypes a mission name and it comes up blue, they don't realize their mistake. Deleting these redirects will slightly inconvenience people who put a typo in the search box, but at least we can say we're doing them a service by helping them learn to spell it correctly. Unverifiable colloquialisms: Prince of Noobs → Prince Rurik Redirects to user namespace: There should be no redirects from any other namespace over to the user name space. Redirects for capitalization when the article name is only two words or has all words in the same case: Charr carving → Charr Carving; Destructive was glaive → Destructive Was Glaive. Could you edit the css, please? See here for the two lines that need to be added (plus a comment?). You don't need to search in the category namespace - once you find a single page of teh category, the link is at the bottom. If you want to find out, hmm, what other pages are there about the Gypsie Ettin, you need to "search" and not "go" for the beast - and then you find its drop rate (it is in mainspace). Grant you, that is not for beginners, but it's not that hard, and I wouldn't want beginners to have a go at these tables. I don't see much room for improvement except automatically calculating the percentages from the totals line. Drop rate/Kanaxai chest and Drop rate/Urgoz chest are in Category:Articles to be moved because "this article should be moved as soon as the chest name is determined". Drop rate/Locked Chest/Far Shiverpeaks/Hard Mode cats as Locked Chest (Far Shiverpeaks) and there is no [Locked Chest (Far Shiverpeaks)] article, so either that has moved to some other name and the subpage didn't, or the page needs to be set up like the others (with tables for normal and hard mode on the same page). 50 gold to whoever gets the reference. Oh yeah, Warwick asked about that once and I said I would... Lemme see if I can find any primary source material from those days, prolly still have some fermenting in the back rooms of my old hard drive. (Reset indent) Well blast, I can't find anything that gives a first-hand description of the Chicken Army, so here's what I can remember. I'm pretty sure the general idea got started the same day as I got the nickname "Dr Ishmael" (which I explained here) back in high school, although I can't remember any exact details. I know it was greatly influenced later when my friends and I worked out our Chinese zodiacs: my birth year, 1981, and time, 18:40, both fall under the rooster sign, thus I became associated with chickens, while The Brutish Celt (who wrote that biography above) had monkeys and another friend had rats. Most of them didn't really develop the animal idea much, though, except that the Celt decided he had a few monkey bodyguards. 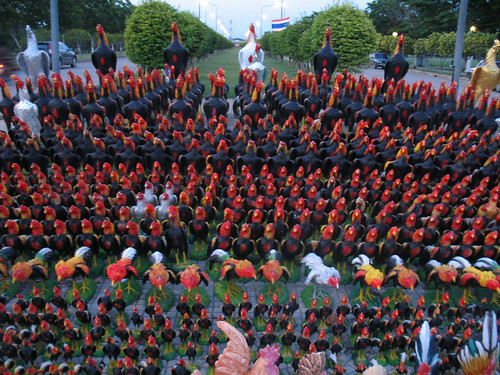 I still have no idea why, but the chickens stuck to me, and then it somehow turned into a whole army, possibly because we had Tyson chicken farms all around my hometown. It quickly became something of a myth among our fellow drama students (yes, I was in drama in high school), and one of them even wrote a story about it wherein I was dubbed "Dr Ishmael, the Chicken King" (that's what I had really hoped to find before). The drama teacher had a tradition where the outgoing seniors would "bequeath" stuff to the juniors, and this "Seniors' Will" would be printed on the back of our drama t-shirts. I, of course, bequeathed the leadership of my chicken army, and it was still being passed down until that teacher retired a couple years ago. Would be great if there was a generic one-page "All useful beginner things to know" which was displayed to everyone after they make account. But would need some real firepower to accomplish (I think?). Other than that...short of a generic Welcome! template, which I dread from GWW horror stories, I am also puzzling for places. Tbh, few people are like Mendel and actively seek out the policies/rules when they first arrive...so unless it's forced on them most people never read policies until they have to deal with one or violated one. It ought not to be that way, I know, but that's asking for a lot. :\ Hmm. Maybe what we really need is something like Wikipedia's "In A Nutshell" policy summarizations for every policy (the ones we have now are not quite up to par across the board), and then those summaries can be put to a Help page which is easily linked to. Plus a few of the unspoken rules/traditions like INAFR, LAME, "first spam", archival...I dunno. Maybe all that would be too intimidating. It needs to be short and simple or it will never get read; yet it has to be informative enough that we don't cause misunderstanding through insufficiency (Staff Meeting Phrases 101). In any case it's a good idea. Yay, a promotion! Do I get a pay increase with that? :P And does that change my job description any?